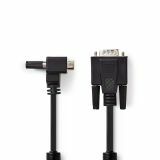 Cable HDMI/M-VGA/M with MicroUSB, 3m HDMI to VGA FLAT cable with length 3 m. Suitable for connecting and transmitting video from a laptop, computer to a projector or monitor. Cable, SCART/m - VGA/f, 2m, black Cable from SCART M to VGA F for transmission of video signals, 2 m.
List Price 7.90лв. VAT Incl. 7.50лв. VAT Incl. 7.27лв. VAT Incl. 6.71лв. VAT Incl. 6.32лв. VAT Incl. 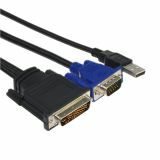 1.8m HDMI-VGA Cable HDMI male to VGA FLAT male cable, 1.8 m, long. 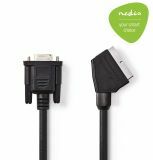 Cable, 30+5pin/m-VGA + USB A/m, 1.8m Cable 30+5pin/m to VGA to USB A/m 1.8m long. Cable Connector, VGA/m - VGA/m, 15 m HQ cable from VGA male to VGA male, with length 15 m.
Cable, VGA/m-VGA/m, 1.8 m Cable from VGA/m to VGA/m, 1.8 m long with double shielding. High quality product from the HQ series. Cable Connector VGA/m - VGA/m, 3 m Cable from VGA male to VGA male, with length 3 m.
Cable, VGA/m-VGA/m, 5 m Cable VGA/m to VGA/m, 5 m,series Valueline. 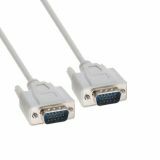 Cable VGA male to VGA male, 15pin, 10m, HQ High quality cable with connectors VGA Male Series HQ Basic. 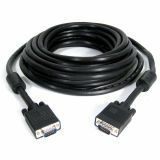 For connecting multimedia, monitors and TVs to computers or laptops. 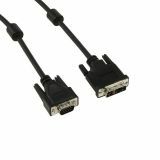 Cable, VGA/m-VGA/m, 20 m, 15 pins Video cable VGA male to VGA male, 20 m, series Valueline. List Price 44.90лв. VAT Incl. 42.65лв. VAT Incl. 40.41лв. VAT Incl. Cable, VGA/m-DVI/m, 1.5m Video cable, a transition from VGA / m to DVI / m length 1.5 m.
Cable, VGA/m-DVI/m, 5m Cable VGA/m to DVI/m 5 m.
Cable, VGA/m-2xVGA/f, 0.20m Video coupler cable from VGA / m - 2 x VGA / f length 0.2 m.
List Price 7.90лв. VAT Incl. 7.50лв. VAT Incl. 7.10лв. VAT Incl.